Can one steal someone’s very being? Take it and run away with it, like any other possession? The very thought adds a chill to the air. Surely that is what the Dracula legend was all about, someone perpetrating an act from which it seemed one might easily recover – a bite – but which, it transpired, would gradually eat up the whole self and replace it with a stranger. Our being is so precious to us. We go through the whole of life taking it for granted, this sense of who we are. I was idly investigating a piece of trivia linked to a London tube station when I came across the end of a story. It was Sloane Square Station, built in 1868, part of the District and Circle lines, in the heart of what is now a salubrious part of London. It seems they had a problem when they built it, because a river ran through it. The River Westbourne. The river which fuelled the Serpentine in Hyde Park also had the audacity to run along Sloane Square and down, eventually, to the Thames. The engineers were temporarily flummoxed . What to do? Diverting a river in the heart of London is not an easy business. Finally, they hit on a solution. They robbed it of its identity. The did not hide it, send it underground or sidewards. 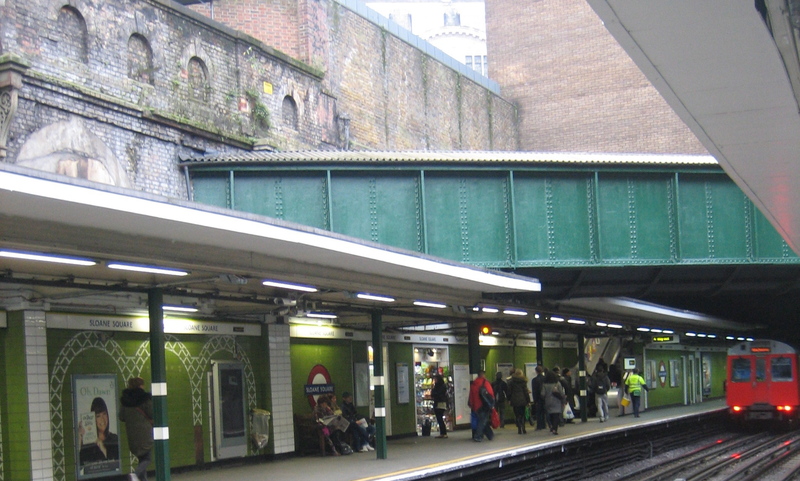 They lifted it high above Sloane Square station using a five foot diameter pipe; above the platforms and the railway, and there, for 145 years, it has flowed, carrying water and fish alike over the heads of the trains and passengers. Poor River Westbourne. Once a royal river, and now a waterway in an iron mask, clad in man-made armour. 92 years after they stole the riverness of the Westbourne, a man threw himself under a train as the waterway flowed sadly above. His name was Peter Llewelyn Davies. And when JM Barrie first met him, he was just a baby in a pram. He and his brothers were the inspiration for Peter Pan, Or The Boy Who Wouldn’t Grow Up. The family moved away in 1904, when the play debuted in London; but in a terribly sad state of affairs Davies’ father and mother died of cancer shortly afterwards, and Barrie ended up adopting them. He was famous, because he was Peter. People knew him as the real Pan. After a time at Eton, Peter served as a signal officer in the First World War in the trenches. He gained the Military Cross but lost his brother George; afterwards, he took up with a woman Barrie deemed unsuitable; Vera Willoughby, 27 years older than himself. And constantly, the fame brought upon him by the boy who wouldn’t grow up haunted him. And then more tragedy: his brother Michael was drowned in an accident at Oxford, aged only 20. He founded a publishing house and attempted to live his life. He married, and had children. But the shadow of Peter Pan was very strong. And when Barrie died there was no sign of recompense for the profound effect Peter Pan had had on his own identity. Barrie left most of his estate to his secretary; the copyright for Peter Pan had already been given to St Ormond’s Street Hospital. Poor Peter. His identity was enclosed by Peter Pan, a boy who refused to grow up, and though he was brought high above the heads of the masses by the Barrie’s attentions, his wings had somehow been clipped. Like the river, the course of his life was altered. Irrevocably. And so he ended it. So can you? Can one steal someone’s very being? Perhaps, if you stand in Peter Pan’s shadow, the answer is yes. Posted in Literary lives, Places to visitTagged London, Peter Llewelyn Davies, Peter Pan, rivers, Sloane Square StationBookmark the permalink. What a sad story. Thanks for giving us the background, Kate. I have a feeling any place you walk through in London has similar tales to tell, Cindy. Noisy with spirits. I had no idea! Very sad – but what a twisty tale you tell – I can’t believe how they diverted the river. I thought of Alzheimers when you wrote about stealing someones being. Funnily enough, so did I, Gabrielle, when I was writing it. I’ve stood on that platform so often. There’s something unutterably depressing about underground stations that the sadness doesn’t surprise me. They seem to be a favourite spot for the terminally sad. Caverns underground often have that connotation, don’t they? You put me in mind of the CS Lewis underground kingdom in The Silver Chair, full of sallow sad enchanted men in waking sleep. Or the Dead Men of Dunharrow doomed to walk the caverns beneath the haunted mountain in Lord of the Rings. The Tube has its own demon too: the Balrog. Those digging out the Victoria Line in the mid 1960s were said to have downed tools because they sensed a dark looming spirit. Really interesting Kate, didn’t know any of that. I was hoping it was a book you’d written – was just about to buy it if so. There’s something exciting about the underground – I loved the idea of mystery there, ever since Quatermass and the Pit, which revolved around a disused London station Hobbs End. Wow Kate, that is a sad story and something I never knew. I didn’t realize that Peter Pan was inspired by a real person. Hi MsDiznee….yes, the story of Barrie and the children with whom he became entranced is a complex one with no happy endings as far as I can see, save the success of its central character, Peter Pan, who continues to rule the world…. That is a very sad story Kate, I never knew that Peter Pan was inspired by a real boy. And very interesting facts about the river and the underground stations. What a sad and interesting set of events, Kate. Yes. I think one’s being can be taken. Like Garielle comments, Alzheimer’s can be such a villain, or ALS, as can fame. I agree. I, like most of us, have lost someone to it. Ghastly business. This creates wonderful food for thought. Should Peter not have risen above the deviation in identity, as the Westbourne did above Sloane Square Station, to emerge unscathed into the main river? Now there’s a completely different perspective, Col! We can’t always choose events around us, but we can choose how we react to them. You have set me thinking; not, of course, for the first time. You set ME thinking on these lines in the first place! Can one steal someone’s very being? This question is more complex then it seems at first glance. I believe the ultimate answer is no because it is our decision to allow another person to affect who we are. With that said, I do believe that people can make our lives difficult whether it is a boss, co-worker, spouse, family, friend or enemy. How we deal with these interpersonal relationships has been a constant learning experience for myself and I don’t expect this to change until the day I die. A very wise answer. I wonder, though, if what happens to us very early on in life can steer us in directions we don’t choose and mould who we are. They did something similar to the river near where my father grew up. It’s like they stole the river. I never thought of using people as inspiration for characters as stealing their being. I hope my father doesn’t feel that way about me. Funny you should say that, Andra: this little piece of research has stopped me dead in my tracks, on the way to publishing a book about Al. Phil was talking about Christopher Robin and how AA MIlne’s books affected him. I shall have to think on’t. I’d never have guessed that odd-looking structure contained a river. Interesting, Kate. I’d heard long ago that Peter Pan was based on a real person, but knew nothing more of it. I always thought it sad, the tale of the boy who never grew up, but now it’s even more sad, as the person the tale was based on never lived a full life. Oddly, it also seems to come full circle in that regard. I don’t think identity is the be all and end all of a person, but it’s rather a large chunk. It is. And if you don’t have a strong sense of self it leaves you open to all kinds of problems…as you say, a sad business, Tom. I knew some of this story before (not the diversion of the Westbourne though) but I found this a very moving retelling, thanks Kate. Finding Neverland, with Kate Winslet and Johnny Depp, was for my taste a rather insipid take on Barrie’s relationship with the boys, but I wish I’d watched the BBC programmes starring Ian Holm when they came out in the 1970s as they got favourable reviews. You’re right to point out the psychological implications of ‘stealing’ another’s being: as well as Dracula it’s behind the idea of Voldemort’s horcruxes and Kaschei’s soul in the egg in Russian folktales (as in The Firebird), and particularly of course in the idea that to know another’s secret name is to be able to control them by magic. Peter must have felt the latter, that by ‘stealing’ his name Barrie had taken control of his future, his fate, and that he couldn’t escape other’s expectations of them. Does it apply to other youngsters whose names have been ‘stolen’, such as Christopher Robin? I see The Lost Boys, the BBC films with Ian Holm, are available on DVD. Strange you should mention him, Chris, Phil and I were talking about whether he was affected by Milne’s work. One of Christopher Robin Milne’s comments? “”It seemed to me almost that my father had got where he was by climbing on my infant shoulders, that he had filched from me my good name and left me nothing but empty fame”. A deeply sad sentiment, though poetically put — at least he had inherited a sensitive side. Intriguing post. And while the story is indeed tragic, and Peter Barrie may have been “stolen,” as he grew older, was there not a point when he could have tried to “retake” himself? A river trapped in a pipe is impotent; it has only erosion as an ability, and no sense of itself. A person can attempt to find freedom using consciousness and freewill (changing their name, moving away, starting anew, etc). Although, noting one of your responses, you commented that perhaps it had something to do with this happening when he was a child (pardon the paraphrase). Perhaps that forged the prison bars too strong. Even for a man with freewill, knowing you can free yourself and actually being able to do so are certainly different things. Great comment, Shelley. You echo my own thoughts completely. Some might have been strong enough to escape Barrie’s legacy; but it seems, not Peter. Very sad. Your story telling is wonderful, Kate ~ certain events in our lives may eclipse or SHADOW us for all the days of our lives..
Nancy, what a lovely comment, thank you so much and apologies for the delay in replying. Life hectic here, but I will be round soon to catch up. Some of us, I believe, start off with many more handicaps than others. Tragic story. You wove in the river beautifully! Thank you, Judy. I have yet to go and see the station…project. That’s wild to know that a river is diverted via that green tube, Kate. Your post inspired me to read the Peter Llewelyn Davies entry in Wikipedia, which I admit is not always the most reliable source of research, but it’s late, I’m tired, and it’s only few clicks away. Had Barrie left the entirety of his estate to Davies, Davies might have felt properly compensated for his contribution to Barrie’s “terrible masterpiece”. Maybe then he would have felt less exploited being so identified with the character. As for one person having the power to steal another’s being, if one person has a ton of money and the other has none, the rich one certainly has it over the poor one, but I think that is also the essence of slavery. As trite as this might sound, my father sees money as being at the root of everything that is wrong with the world. And I tend to agree. I couldn’t agree more. The idea of slavery rings true here, however gentrified and accepted by the society of the time. This would all be trivia if it wasn’t so damm interesting and culturally significant. Malcolm, thank you. Every event has its place. This leaves me breathless, Kate, with such a wonderful telling of an incredible chain of events. This was a superb story, and yet I feel a little sorry for enjoying it as much as I did–it’s just such a sad outcome! Debra, hat an incisive thing to say. Even today we are entertained by Peter, and I suppose I am playing the part of Barrie. Thank you for sharing this. I had no idea that Peter Pan was based on a real person: tragic story. I especially like the way you describe the river whose being was stolen with Barrie’s composition. Thank you, Kathleen. I am always incensed when they block up a river. When you think of the pleasure and space they add to our lives. Gosh, what a sad back-story to a much loved children’s classic. Fascinating, Kate. Thanks. You’re welcome, BB 🙂 Thanks, as always, for coming along to read. You’re right: there were many tragedies; the First World War brought tragedy to most families. I cannot imagine what that did to England and the other countries involved. Wow, Kate. That’s an terrible and fascinating end to Barrie’s story. I had no idea.